The American economy has been growing for the past ten years, yet more and more people are struggling to pay rent. 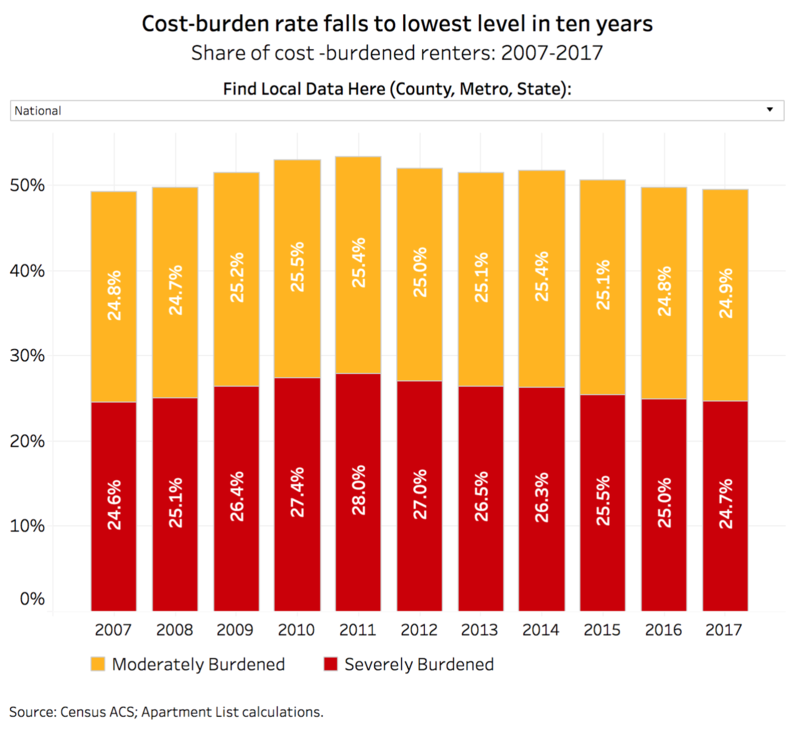 According to the new report published by Apartment List, almost half of American renter households can be classified as cost-burdened as cost-burdened, spending more than the recommended 30% of their incomes on rent. Even though the national cost burden rate slightly decreased, it remains at approximately 50%. The national cost burden rate showed a slight improvement, decreasing from 49.7% in 2016 to 49.5% in 2017. The share of severely burdened renters (who spend over 50% of their household income on rent), decreased from 25% to 24.7%. The share of moderately burdened renters increased from 24.7% to 24.9%. Despite the recent general improvement on the subject, the issues of affordability remain immense. 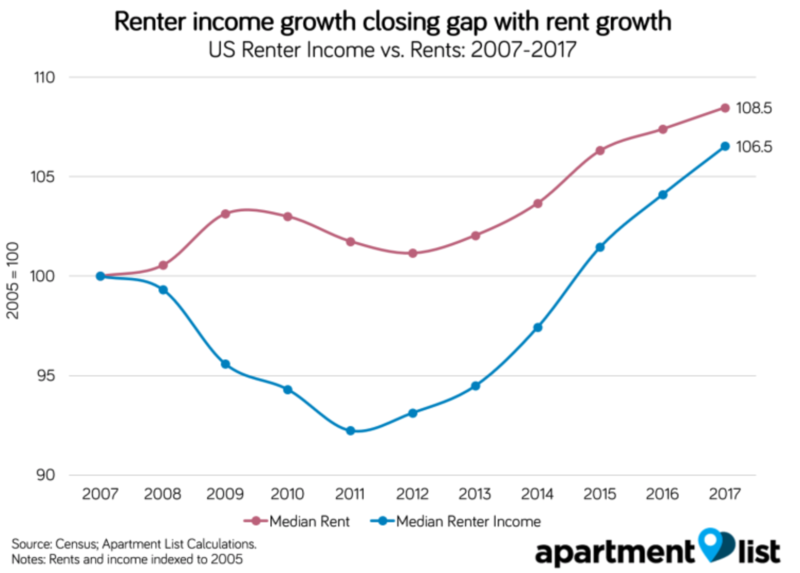 Close to one in four households spends at least 50% of their household income on rent, and half of renter households find themselves exceeding the recommended housing budget. There has been an increase in political activity on the matter. Unfortunately, the statistics remain low, with just 22% of the housing-related bills introduced in the current 115th Congress specifically mentioned renters. None have been passed into law. The number of cost-burdened households reached an all-time high in 2014, even with the cost burden rate was improving. Luckily, the number of rent-burdened households has started to fall and is currently 774,000 households lower than the 2014 peak. That said, the total number of rent-burdened households remains 3.1 million households higher than in 2007. The median renter is cost-burdened in 20 of the 25 largest metros. With 62.7 percent, Miami has the highest cost burden rate of the nation’s 100 largest metros. In addition, nearly one in three cost-burdened renters lives in CA, NY, or FL. At a closer look, Dallas, Minneapolis, Charlotte, St. Louis and Houston are the only five metros where the median renter can comfortably afford the median rent. This indicated that rental housing affordability affects low-income and millions of middle-class households, as well. At last, Apartment List explored the relationship between income growth and cost-burden increase. 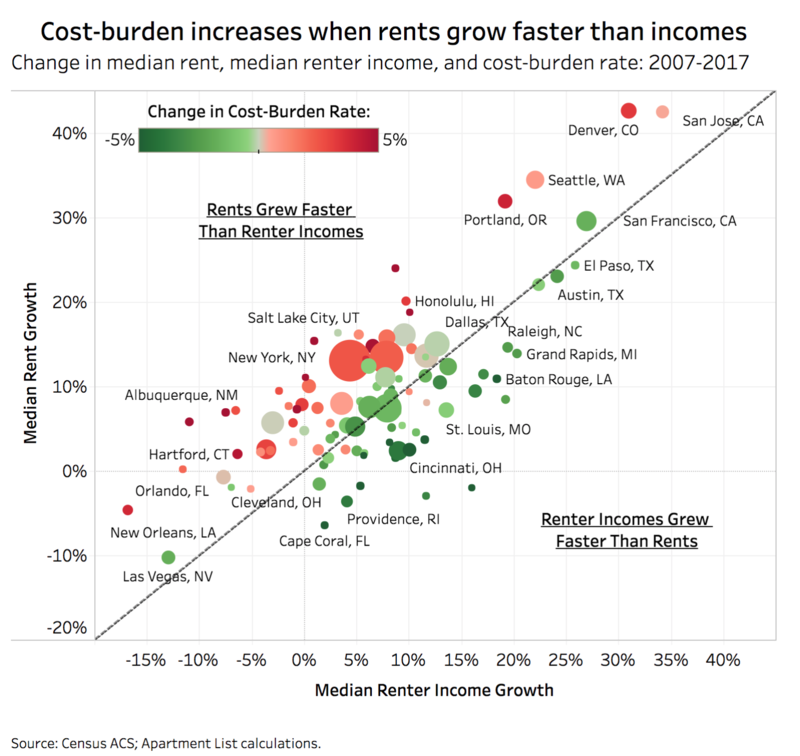 Below is a chart that demonstrates that when income growth outpaces rent growth, cost burden rates will tend to fall.